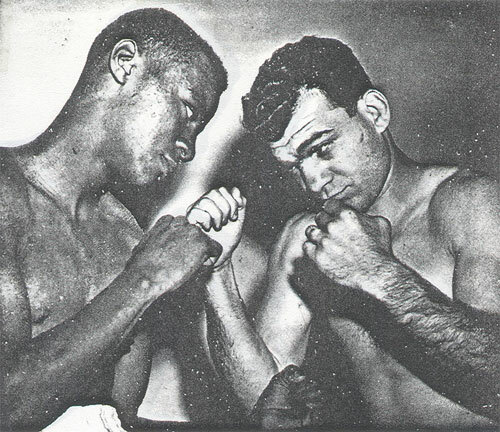 On this day in 1945, lightweight sensation in the making Wesley Mouzon defeated tough South Philly vet Eddie Giosa by decision in an 8-round main event at the Met on North Broad Street. It was the second time Mouzon won a bout with Giosa on points. Giosa started strongly and won the first two rounds with effective aggressiveness. Giosa repeatedly bulled Mouzon to the ropes and worked on the inside. Mouzon, a 7 to 1 favorite, took the hint and went on the move beginning in round three. But as he backpedaled, Mouzon fired his sharp combinations at Giosa and landed freely. As the fight wore on, Wes piled up the points and put the remaining rounds in the bank. In his very next bout, Mouzon would draw with Ike Williams and officially become a boxing sensation.